Liz #5 is a pristine gem. It is Warhol at his very best with a perfect screen, glowing colors, and impeccable provenance. 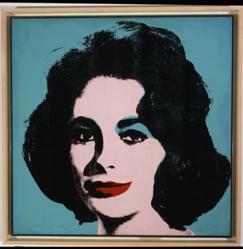 She is classic yet every bit as cutting edge as she was when Warhol painted her nearly 50 years ago. Phillips de Pury & Company is honoured to announce the sale of a rare, iconic portrait of the legendary actress Elizabeth Taylor, painted by Andy Warhol in 1963. The stunning painting will be offered for sale in the Contemporary Art Part I auction on May 12th and is estimated at $20,000,000 / $30,000,000. In Liz #5, her unforgettable face emerges from a rich turquoise background, perfectly capturing her luminous skin, striking violet eyes and red lips. The power of her attraction has never been as evident as it is in this Warhol painting - a dazzling tribute to Elizabeth Taylor. This striking portrait is a testament to the legend and beauty of one of the world’s most beloved and iconic actresses, both capturing her very essence and transcending the limits of time.